The MBD99 clay based desiccant manufactured by Australian Warehouse Solutions ensures the export cargo will arrive at its destination in pristine condition. When packing export containers in Australia on a typical 27°C day, the problem of moisture is never even considered as an issue for their shipments by most exporters. However, when the same container gets to the equator or is trans-shipped via Singapore, the internal temperature in the container is probably exceeding 50°C creating ‘cargo sweat’. Cargo sweat can cause problems such as mildew, rust and sodden cartons, with the valuable shipment probably arriving in a sorry state and possibly not suitable for sale. However, by simply adding AWS’ MBD99 desiccant, the container shipment can be protected during its journey. By continuously absorbing moisture for the duration of the voyage, the desiccant prevents ‘container rain’ and all the associated problems. 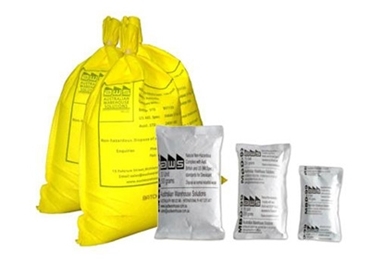 Manufactured by AWS for over 25 years, MBD99 clay based desiccant is used by numerous Australian exporters to protect their containerised freight. Supplied in a 130-unit size for export containers, the desiccant is excellent cost-effective transit insurance for the cargo. Usually eight bags are used per 20’ container, absorbing over 10 litres of condensation during the duration of the voyage. MBD99 is also manufactured by AWS in a variety of smaller sizes to protect boxes or individual pallets.